For Immediate Release: Posted On 10/26/2012 By Industrial Magnetics, Inc.
Industrial Magnetics, Inc. announces a line extension of its Rare Earth, Bullet® Magnet, called the 4JIT Bullet®, designed for flexible-hose pneumatic line systems to improve product purity and protect processing machinery from tramp metal damage. Consisting of a 100% stainless, two-part body, the BM4JIT’s inlet and outlet is designed to install to a flexible hose system, allowing dry powder and granular materials to pass through the magnetic housing and be purified of metal contaminants. Access to the magnetic circuit is achieved by opening the Tri-clamp on the housing and removing the lower body to clean collected tramp metal. Because it installs to flexible line pneumatic systems, the BM4JIT is a portable and versatile magnetic solution and can be used ahead of processing equipment to protect machinery from tramp metal damage and at bulk load out zones to ensure product purity. 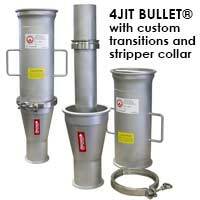 The 4JIT Bullet® is designed to operate leak-free at up to 130 psi and is capable of operation in explosive environments. Standard design is available for 3", 4" and 5" line sizes, with custom options available upon request.